Available in Amethyst, Blue, Brown, Green, Grey, Honey, Turquoise, Pure Hazel, True Sapphire, Brilliant Blue, Gemstone Green and Sterling Grey. You will be able to select your colour choice when entering your prescription details. 2 lenses per box @ $21.40 per box. Minimum order 6 boxes. 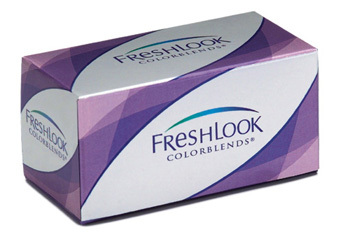 A perfect choice for someone wanting a gentle change to their eye colour, the Freshlook ColorBlends combines three colours on one lens to give a subtle, natural look. Also suitable for those with darker eyes.